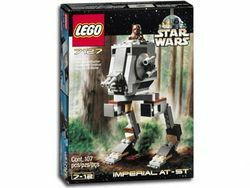 7127 Imperial AT-ST was a set released in 2001 as part of the Star Wars Classic line, that consists of 107 parts, making up a walker and a minifigure. This AT-ST is one of the older Star Wars sets, and contains no weapons for Chewbacca. The vehicle is built from grey, brown, and beige pieces, brown and beige being non-canon. The walker is much smaller than other AT-STs, such as 7657 AT-ST, and has very thin upper legs. The hatch on the top is very small, rendering it hard for Chewbacca to get in, and the 'eyeholes' of the walker would be very hard to see out, which would mean the pilot would have to drive blind. The front guns on the AT-ST are made of the lightsaber pieces that are of a grey finish. The 'walking' function that connects the body to the legs resembles that of the Rock Raiders Granite Grinder. AT-STs are forged at Kuat Drive Yards, or KDY. The walkers that were on Endor were part of Tempest Force, and a lot were destroyed by the ingenious Ewoks, using all sorts of methods such as log battering rams, rolling logs, and many more. Chewbacca, along with three Ewoks, captured an AT-ST and blew up another with its laser cannons. Han Solo later took over the AT-ST from his sidekick and deceived the Imperial workers inside the bunker. The AT-STs play no further part in the story after the bunker blows up. This set's box has the original LEGO Star Wars design, which includes a gold Star Wars logo, and above it the the comic art versions of Han Solo, Princess Leia, Luke Skywalker, Darth Vader, a Stormtrooper, and Boba Fett minifigures. The box depicts everything included in this set. The set contains a dark brown Chewbacca Minifigure (rather than the more recent red-brown version), and was only the third set to contain him at the time it was released. This is a description taken from LEGO.com. Please do not modify it. Chewie saves the day! In the heat of battle, Chewie commandeers the Imperial AT-ST. When Han and Leia see the machine approach, they think all is lost until Chewie bursts out the top! Now you can be part of the action with this lifelike set, complete with blaster cannons, legs that "walk," and a command cabin! Facts about "7127 Imperial AT-ST"
Chewie saves the day! In the heat of battle, Chewie commandeers the Imperial AT-ST. When Han and Leia see the machine approach, they think all is lost until Chewie bursts out the top! Now you can be part of the action with this lifelike set, complete with blaster cannons, legs that "walk," and a command cabin! This page was last edited on 19 July 2016, at 20:39.